The Mexican investor and business magnate started by selling dry goods and finally ended up in real estate, mining and investments. 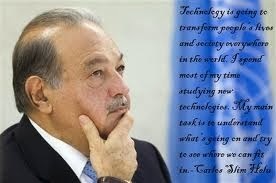 A great philanthropist, he has also donated R36-billion to the Mexico City Downtown Foundation. Gates has not only been eminent in the world of PCs and Microsoft, but has also been a recurring figure in lists of the world's wealthiest people and was in fact the wealthiest from 1995-2009. In 2011, he was the wealthiest American and the second richest worldwide. He started out as a brilliant student who enrolled at Harvard College with a SAT score of 1590/1600, and was the first to propose a faster algorithm for pancake sorting. He has been called everything from the "Wizard of Omaha”, to the “Oracle of Omaha”, and also the “Sage of Omaha”, which is where he launched his career an investment salesman and stockbroker, which eventually led to him becoming a multimillionaire (and now billionaire). He has reportedly given away a large percentage of his fortune. Arnault was the only child of the family who proposed to shift the focus of their business and liquidate the construction division, to move into the real estate business. He personally indulged in a more conservative economic path and served as a CEO to a luxury goods company. The wildly popular chain of Zara clothing and accessory retail stores belongs to Spanish fashion executive, Gaona. He focused on quality and implemented a shrewd business plan where he kept profit margins very low, which eventually paid dividends. The chief executive of one of the world’s leading enterprise software companies earns 22.5% of his fortunes from the Oracle Corporation. Research into “A relational Model of Data for Large Shared Data Banks” inspired him to enter into the database arena. This Brazilian business magnate has made his fortune in oil, gas and mining explorations. He is also the chairman of five companies under the EBX Group umbrella. The current chairman and main shareholder of a fashion giant, Persson is a Swedish business magnate with a kind heart who funds the Mentor Foundation, a charity that combats substance abuse among young people. Asia’s most powerful man is the world’s largest operator of container terminals and the world’s largest beauty and health retailer. Working 16 hours a day since the age of 15 , he was forced to leave school after the death of his father. By 50, he honed the tactical skills and sharp mind of an entrepreneur that allowed him to start his own company. Albrecht is the oldest and most familiar (recurring) individual to be found in any top 20 list of billionaires. Along with his brother, he has founded and continues to run the rule over discount supermarket chain, Aldi.